““A 10th century vagabond in China named Pu-tai was known for his jolly demeanor. He in fact became the model for the Laughing Buddha. His name means Hempen Sack, and in fact he was also known to carry around a sack from which he would distribute gifts to children. Pu-tai was known as a Ch’an (Zen) Master and after he died it was believed that he was an appearance of Bodhisattva Maitreya. Now, it seems obvious to me that Pu-tai and Santa Claus share many of the same characteristics, and in Buddhism that means that they are likely appearances of the same celestial bodhisattva, in this case Maitreya. Now Maitreya is the future Buddha who is waiting in the wings (so to speak) in the Tushita Heaven. It would appear then that Santa Claus is in fact the future Buddha and that the North Pole is actually the earthly manifestation of the Tushita Heaven (which only Bodhisattvas and Buddhas can see in its true aspect). 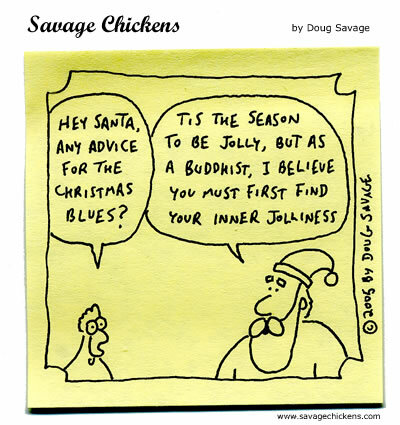 Yes, connor, there IS a Santa Buddha. Wow! I get a daily laugh from the chickens, and learn fascinating things as well. And I thought I was just coming here for the jokes. Thanks John, and merry Christmas to you too. I think maybe you have had to much coffee with your zen John.